The main goal of your restaurant marketing strategy should be satisfying customer’s needs in the best possible way. Thanks to this, you will be able to win their loyalty and respect. But how do you know what the guests think about your food place? It is not difficult to find this out. All you need to do is to simply listen to their opinions. 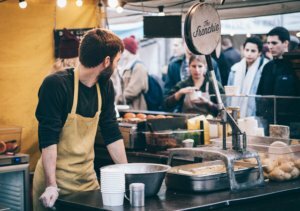 Read our 4 useful restaurant marketing ideas to find out how to collect and use customer feedback for your restaurant’s development. It requires less effort than you may imagine and could lead to actually beneficial results. Let’s start with this simple yet quite smart restaurant marketing idea – have a nice conversation with the guests. Have you just noticed that your customers leave some food on their plates? Do they seem to complain to each other about something? Learn what the issues are by politely asking for opinions about guests’ restaurant experience. The customers will most likely appreciate your honest care. Thanks to this, you will probably end up with valuable, authentic feedback. Instagram, Facebook or Twitter? Most of your customers probably use at least one of these portals. Obviously, your food business should show activity on social media as well. Take some time to monitor social media at least time to time and you will probably find plenty of different comments about your eatery. These days more and more users share their thoughts about their restaurant experiences on the Internet. Moreover, you can encourage online users to answer your questions at the restaurant Facebook page. It could also be a good idea to offer an extra discount for people who made an effort to share their feedback with you. Learn more about effective restaurant online marketing with a Facebook page here. 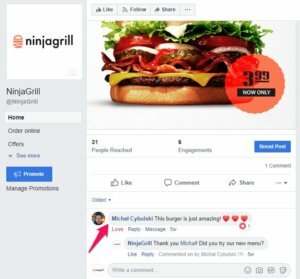 Another important part of restaurant online marketing is to follow some other portals with customer reviews on a regular basis. You can find millions of opinions for example on tripadvisor.com. It is a website of the famous American company which was built to let customers share their feedback about many different restaurants and hotels. 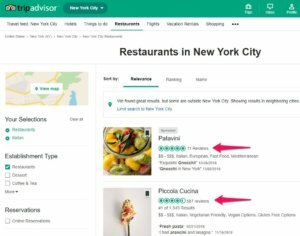 Make sure that your food place is available on TripAdvisor and read comments about it. Try to do it as often as you can. You may also go through feedback about your competition to get inspiration for some original improvements. Sometimes a single negative opinion on social media may have really unpleasant consequences for your food business. Fortunately, there is a way to see the feedback of your customers without witnesses. How could you do this? Allow your customers to share their opinions while they make orders online. Consider using UpMenu system which makes this smart option possible. Thanks to this online food ordering system, the opinion of your online customer is sent directly to the administrative panel. This way, you have a precious opportunity to quickly read it and react – before the potential critic will spoil your restaurant’s reputation on Instagram or Facebook. Talk to your customers (in person and via social media), read the opinions on different portals and make it possible for guests to share their thoughts while placing orders on the Internet. This way you will be able to gather a lot of valuable feedback from different groups of customers. Remember that collecting opinions is not all. You should react to comments, show honest care and be able to apologize in case of mistakes. Treat your customers with a real respect and they will reward your business with what matters the most – their loyalty.